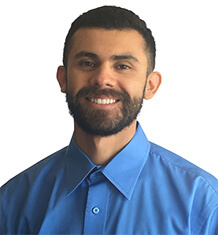 David graduated from the University of Nevada, Reno in 2011 with a Bachelor’s of Science in Community Health Sciences and a Bachelor’s of Arts in French. It was in his final year of college that David found his interest in physical therapy when he took a course on kinesiology. This course was taught by two physical therapists and throughout the course, David discovered and developed an affinity for the physical therapy profession. David received his Doctorate in Physical Therapy in 2017 from A.T. Still University. David joined MTI Physical Therapy’s Magnolia clinic in 2018 and is looking forward to pursuing further training through the Ola Grimsby Institute’s manual therapy residency program, where he will further develop his clinical reasoning skills concentrated on orthopedic care. In his free time, David enjoys traveling and spending time outdoors. Just before joining the MTI team, he spent three months exploring South America and looks forward to spending more time traveling in the near future.